On a cool spring day in late March, a tired and tattered butterfly, still striking in her deep orange and black wings, alights on a milkweed plant in a Texas field. She lays several eggs on the plant, securing each egg firmly to the underside of a leaf with a glue secreted from her body. Having now laid the last of her eggs, she falls gently to the ground, exhausted, weakly flapping her wings for the last time. She and tens of millions of her kin, the Monarch butterflies, have just completed a long journey. They began their lives in the fall of the previous year, in the northern United States and southern Canada, east of the Rocky Mountains. Somehow sensing the encroaching cold, and guided by mysterious cues that scientists have yet to understand, the Monarchs began a southward journey. Their destination was the mountains of central Mexico, where they would pass the winter months. After five months of semi dormancy — a time of inactivity somewhat like hibernation — the first stirrings of spring invigorated the butterflies, beckoning them northward. But not too far north. In the Southern states east of the Rockies, the females laid their eggs on milkweed plants that would serve as home and food for their larvae. Shortly afterwards, the butterflies, having fulfilled their reproductive purpose, died. The Monarch butterflies of North America, east of the Rocky Mountains, are unique in the insect world. They undertake the longest migratory journey of any insect. There are other Monarchs in other places as well; the North American west coast population also migrates, wintering along the coast of southern California and venturing as far north as southern British Columbia in the summer. In the tropics of Central America, a sedentary Monarch population thrives, reproducing throughout the year. Monarchs have also been introduced, and have established breeding colonies, in Australia, New Zealand, Hawaii and other Pacific Islands, as well as Spain, the Azores, and Bermuda. But it is the mysterious Monarchs of eastern North America that captures the imagination of nature lovers: why do these butterflies converge each winter at specific sites in the mountains of central Mexico? How do they find their way there? And how do they survive their 5 month semi dormancy in the mountainous forests? 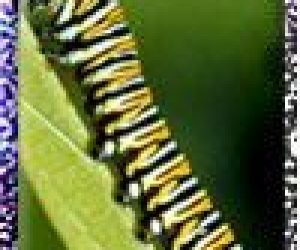 The basic life cycle of a Monarch butterfly is no different from other butterflies. They undergo the four typical life stages: egg, larva, pupa, and adult. Monarch caterpillars feed exclusively on the leaves of many species of milkweed plants. During her lifetime, a single female can produce anywhere between 100 to 400 eggs. Sometimes, several eggs are laid on a single plant, each on the underside of a leaf and attached by glue secreted by the female Monarch. Four days later, a small caterpillar emerges. Caterpillars are eating machines. A caterpillar’s first meal is the eggshell that once encased it. From there, it proceeds to devour the leaves of its milkweed home and begins to grow at a rapid rate. The milkweed leaves are not just a source of food. The leaves also contain toxins that are stored in the animal’s exoskeleton for the rest of its life, making both caterpillar and butterfly poisonous to most predators. As the caterpillar grows, it sheds its skin to accommodate its growing body. During the summer, the caterpillar phase can take as long as 9 to 15 days. After 15 days of eating and eating, the caterpillar is more than 3,000 times heavier than the egg it emerged from! The caterpillar stage ends in a transformation. After attaching itself under a leaf with silken threads, the caterpillar sheds its skin for the final time, and a pupa emerges. This stage, called chrysalis, is when the caterpillar makes its transformation to a butterfly, rearranging its internal organs to metamorphose from a voracious leaf-eater to a nectar-sipping winged beauty. Ten to fifteen days later, an adult butterfly emerges, still moist, wings crumpled from being compactly folded in the pupa. After several hours of stretching and drying out, the butterfly takes to the air for the first time. A Monarch is as light as air, almost, weighing between one-tenth to one-third the weight of a dime. It will not grow anymore. All the sustenance it derives from nectar will serve as energy for body functions and flight. Only 3 to 8 days after emergence from its pupa, the butterfly is ready to reproduce. The life span of an actively reproducing Monarch butterfly is fleeting, only 2 to 5 weeks. The first generation of Monarch butterflies born in the southern states emerge around late April. In the south, where cool springs give way to scorching summers, Monarchs are at a disadvantage. Hot dry conditions make it hard for the larvae to survive. Also, the milkweeds they depend on die off by June. To continue reproducing, the monarchs fan northward. They produce more offspring, and their offspring produce yet another generation, spreading as far as there are milkweed plants, as far as southern Canada. Three generations of butterflies will live and die during the summer breeding season, as they spread across their North American breeding range. The fourth and final generation for that year is born in early fall. Instead of reproducing, they embark on a long journey to the wintering grounds of their great-great grandparents, so that they may return north the following spring to sow the seeds for next year’s generations.